Prototype: Former Swiss Postal System PTT class Ee 3/3 "Halbschuh" / "Casual Shoe" electric switch engine. Oxide red version. Design from the first production series in 1927/28, with a cab at one end and a switchman's platform at the front. The locomotive looks as it did in Era IV. Model: The locomotive has an mfx+ digital decoder and extensive sound and light functions. It also has controlled high-efficiency propulsion with a miniature motor and a flywheel. 3 axles powered. Traction tires. The triple headlights and dual white marker lights change over with the direction of travel, will work in conventional operation, and can be controlled digitally. The lighting can be changed in digital operation to the Swiss headlight / marker light code, with 1 white marker light as well as 1 red marker light when the locomotive is running "light". Maintenance-free, warm white and red LEDs are used for the lighting. 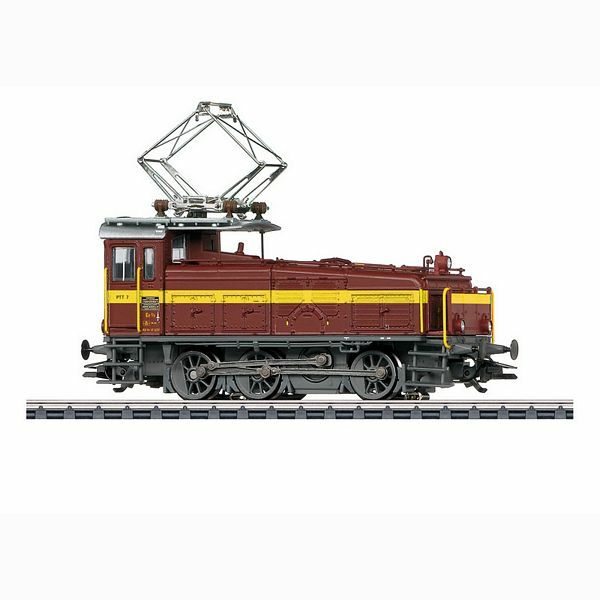 The locomotive has finely detailed metal construction with many separately applied parts. It also has detailed roof equipment with double-arm pantographs. Length over the buffers 10.9 cm / 4-1/4". Locomotive can be switched to the Swiss headlight / marker light code and a red marker light for running "light"
SBB “Halbschuh” / “Casual Shoe” Ee 3/3 16311-16326 Increasing electrification of the Swiss railroad network pointed up a need for electric switch engines. Compared to steam locomotives electric switch engines were ready to run without a lot of preparation time and only required power when they were actually in operation. After two prototypes (Ee 3/4) were taken into operation in 1923, the SBB purchased a first series of 16 units starting in 1928 from SLM and BBC. These three-axle units could be produced without a pilot wheel set due to technical progress in lowering the weight of their components. They were designated as Ee 3/3 16311-16326. They had a cab at one end of the locomotive, which together with the rather extended roof quickly acquired the more or less affectionate nicknames “Flat Iron” or “Casual Shoe”. A characteristic feature was its Winterthur diagonal drive with a jackshaft powered by the traction motor and connected to the driving wheels by side rods. High levels of tractive effort could be realized by the wheel sets connected together without individual axles slipping. This concept was also used at that time on faster locomotives, but its real strength was in those situations where it was a matter of high levels of tractive effort. These locomotives were controlled by a flat sliding step switch with thirteen speed levels that controlled the voltage at the traction motor. These quaint switch engines were gradually retired starting in 1980. At the end of 1997, the last five units of the existing Ee 3/3 of this series still on the SBB were taken out of service. The “Casual Shoes” sold previously to private operators held on several more years until about 1995/96. Several units remained preserved such as road number Ee 3/3 16318 at Locorama in Romanshorn or road number Ee 3/3 16311 at Swisstrain. Triple headlights and two white marker lights that change over with the direction of travel.